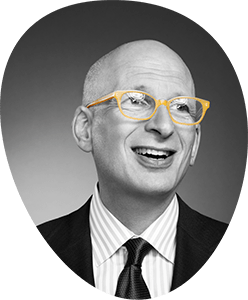 Certainly the fastest low-hassle method is to subscribe via Twitter by following @ThisIsSethsBlog Many people find this simple, but the challenge is that your Twitter feed might be so active you miss some posts. If you’re not already doing it, you can sign up via email. This is pretty direct though you may discover that somewhere between you and me, a spam filter that neither of us can control shows up. If you use the email option, be sure to hit the confirmation link you get in the email, and don’t choose “Tweets you share with your followers” unless you want a daily retweet to happen automatically from you to your followers. Some people prefer to follow the feed on facebook. You can also get this on your Kindle, but that costs money, not a penny of which goes to me. But hey, if it works for you, go for it. And of course, you can always bookmark this page on your browser and come visit me now and then. I started the grandfather of this blog in 1991 (not a typo) with an email newsletter. Some of you were on that original list, twenty years ago. In this incarnation, there have been more than 4,300 posts… It’s been a good run so far, I think–this blog regularly reaches over a million people. Thanks, guys (old and new), for your frequent attention and kind support.